Create custom components in the ExtendSim development environment plus learn how to maximize usage of equation-based blocks. 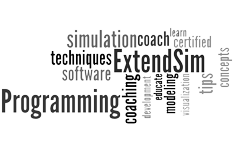 ExtendSim provides both an internal programming language and API. These two integrated features allow you to create custom modules and capabilities for ExtendSim, including accessing code written in external languages. Students start by building an ExtendSim block and storing it in a library. During the course, you will add features to the ExtendSim block as you delve deeper into the development environment. After taking this course, you should have sufficient knowledge to create custom components and features in ExtendSim. This course is designed for Engineers, Managers, System Analysts, and anyone else who wants to learn how to create custom components and features in ExtendSim. There is a maximum limit of 4 students per class so register early. Essential ExtendSim Training, or, on instructor approval, a comparable proficiency is required. Familiarity with programming concepts and terminology (C++ recommended). At the completion of this course AND the Database Modeling Techniques course, students are certified as an ExtendSim Professional Modeler. $1600 for the 2.5 day workshop.